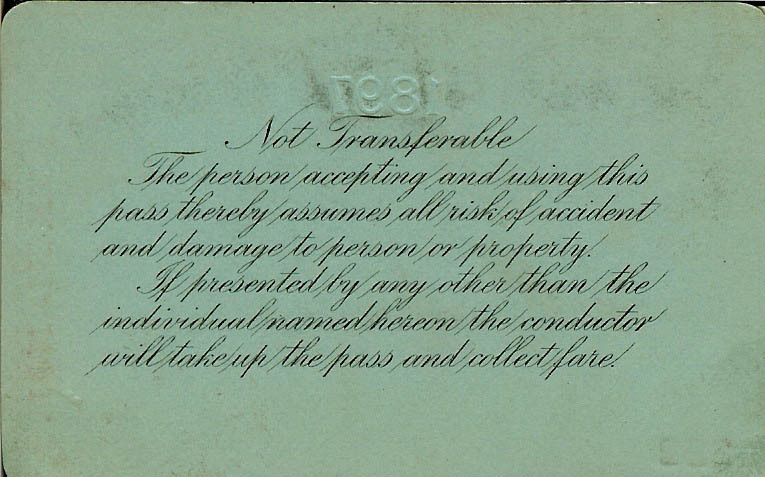 Pass issued October 14, 1869, to H. A. Martin, near fine condition. 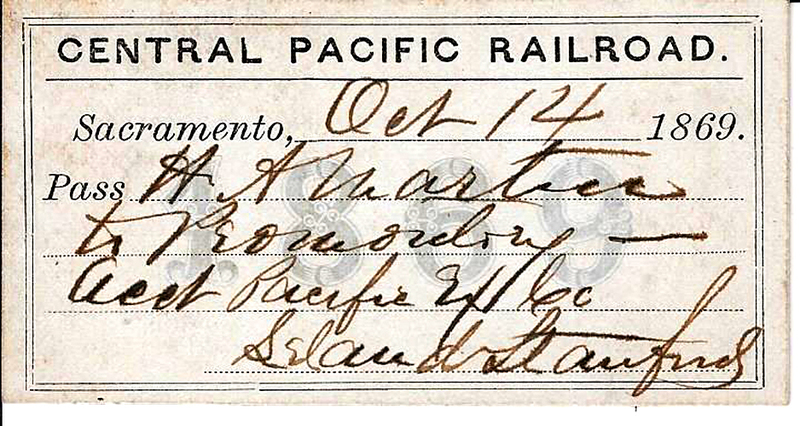 California railroad pass; in the year the Central Pacific and Union Pacific met at Promontory, Utah, forming the Transcontinental Railroad. Leland Stanford was one of the "The Big Four -- The Associates" who financed this landmark project; the others were Charles Crocker, Collis Huntington and Mark Hopkins. This railroad project was authorized by Congress in 1862. 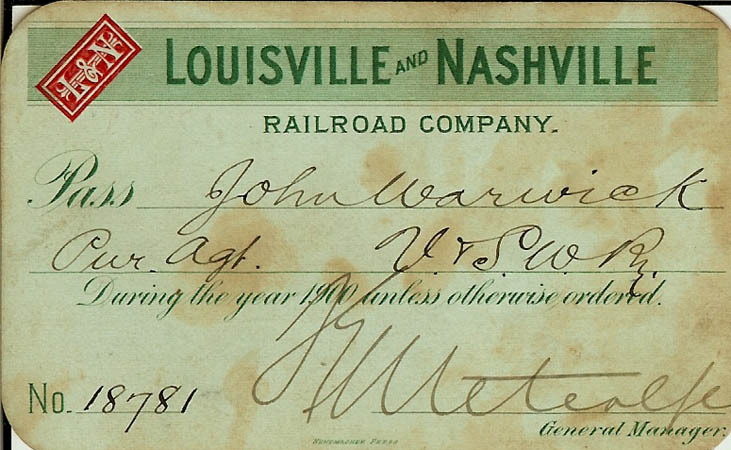 Railroad Pass No. 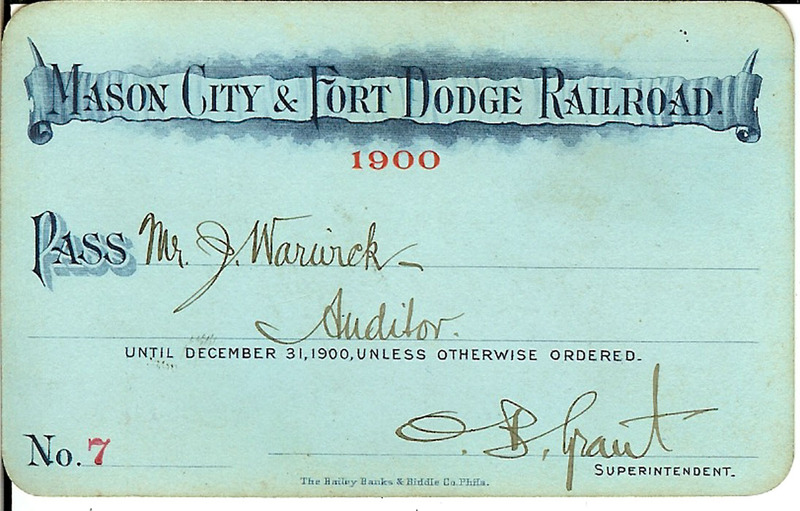 1380, issued to J. Warwick, General Purchasing Agent; and, countersigned on back by R.T. Pace. 1897. Condition: a few light smudges; otherwise near fine. 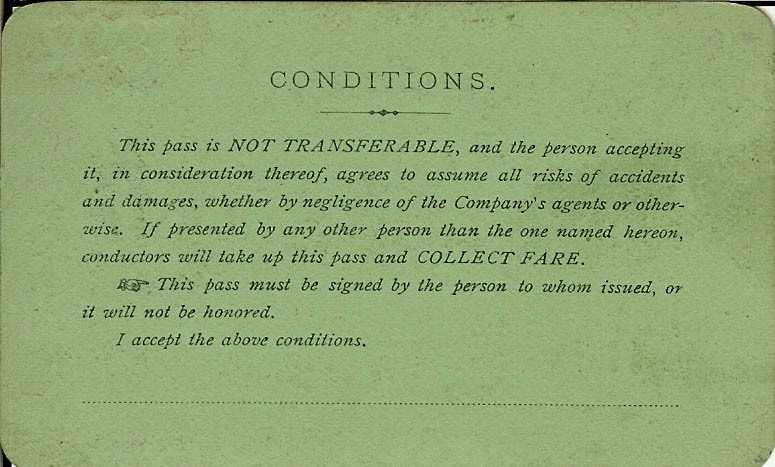 Railroad Pass No. 1622, issued to J. Warwick; countersigned by J.R. Kenly, General Manager. Condition: very good plus; several light aging stains. 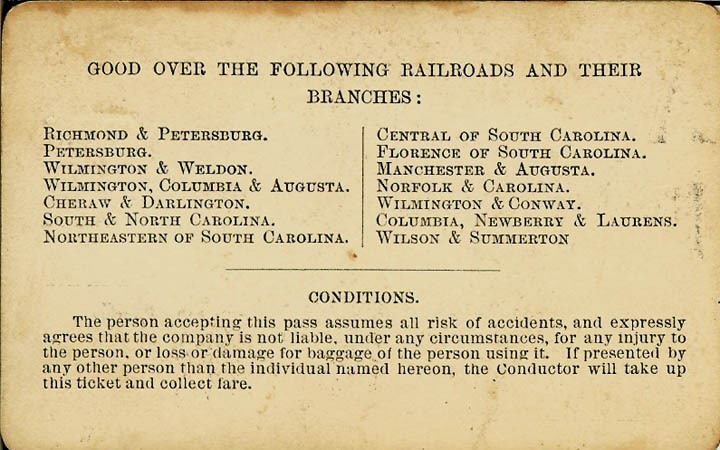 Good over the following railroads and their branches: Richmond & Petersburg; Petersburg; Wilmington & Weldon; Wilmington, Columbia & Augusta; Cheraw & Darlington; South & North Carolina; Northeastern of South Carolina; Central of South Carolina; Florence of South Carolina; Manchester & Augusta; Norfolk & Carolina; Wilmington & Conway; Columbia, Newberry & Laurens; Wilson & Summerton. Virginia, Georgia, South Carolina, North Carolina. 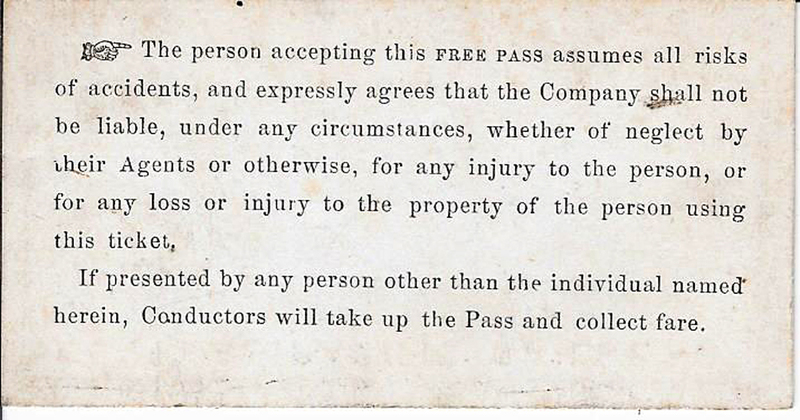 Railroad Pass No. 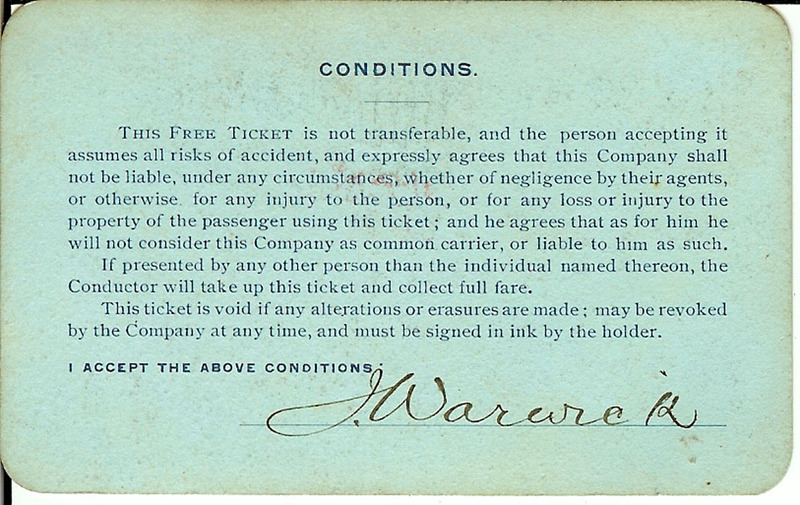 3427, issued 1895, to John Warwick; countersigned by B.A. Smith. Near fine condition. 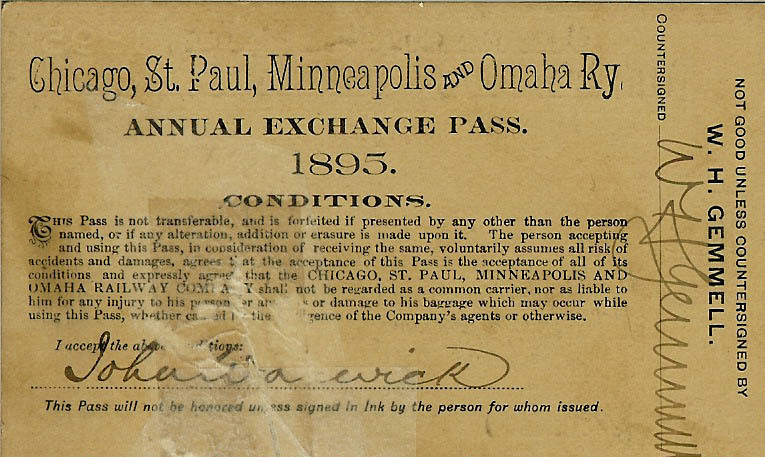 Pass was good for railway travel in Minnesota, Missouri, Kansas, Illinois and Iowa. 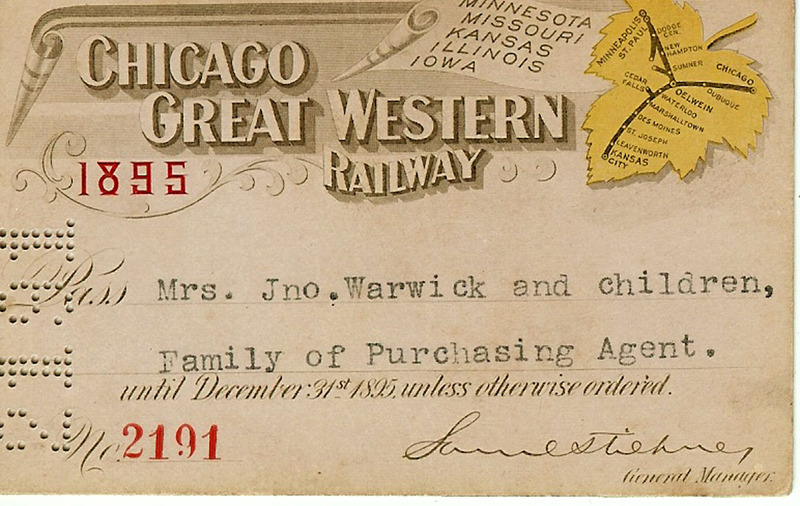 Signed by George H. Mead and Ina Warwick, wife of John Warwick. 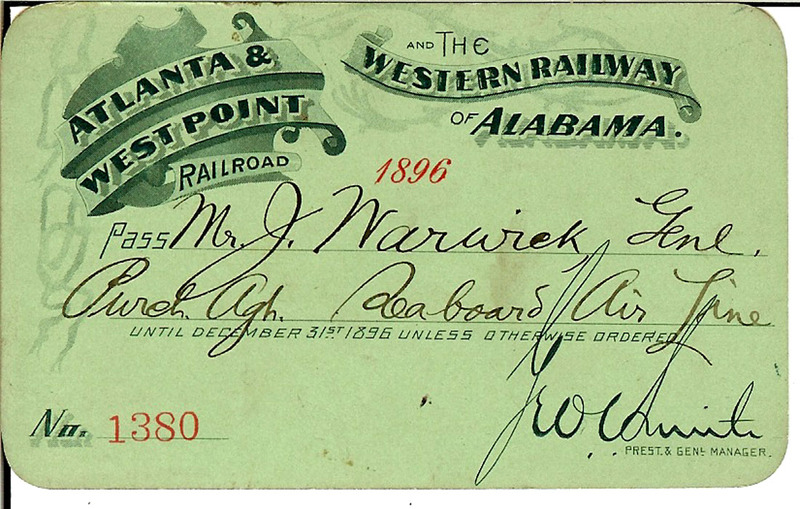 Railroad Pass No. 2191. 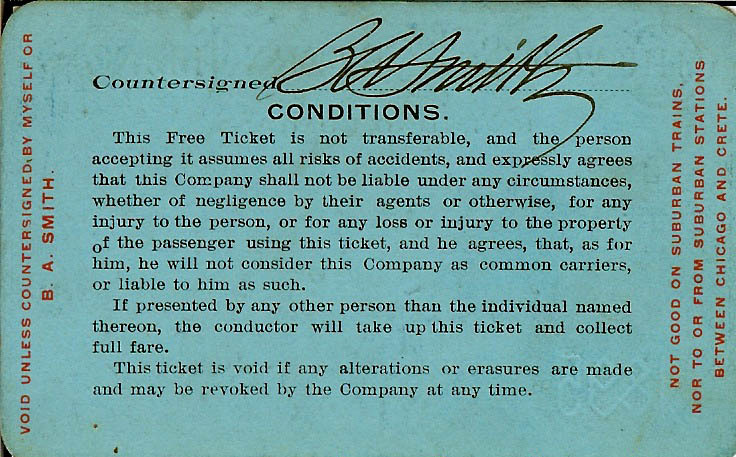 Issued 1895. Very good plus condition. 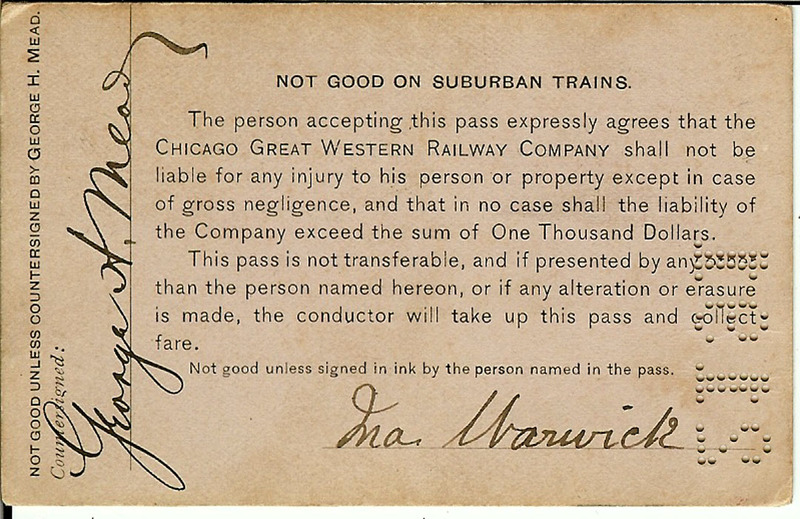 Railroad Pass No. 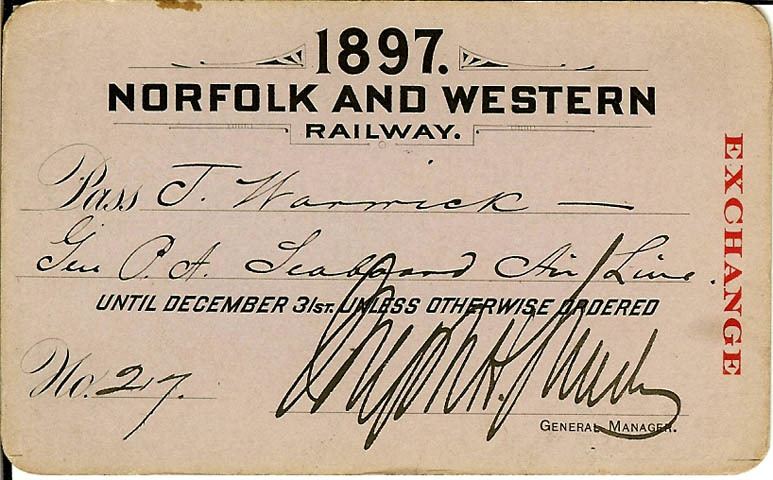 2629, issued to John Warwick, 1895; countersigned by W.H. Gemmell. Condition: good only; pass has been torn or cut in the past, repaired by tape; then, tape was removed and conservation adhesive properly used. Cut or tear is approximately 1-inch long, extending from the bottom of the pass, under the General Manager's signature up into "G" of "Pur. Agt. C.G.W. Ry." Railroad Pass No. 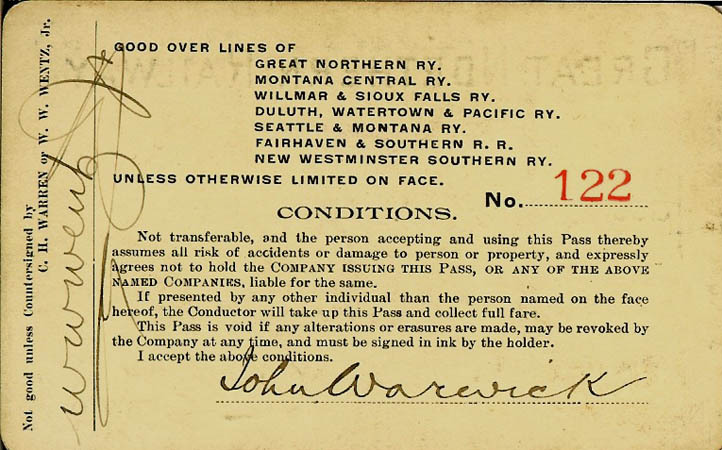 122, issued to John Warwick, 1895, signed on back and countersigned by W.W. Wentz, Jr. Good over lines of Great Northern Railway, Montana Central Railway, Willmar & Sioux Falls Railway, Duluth Waterton & Pacific Railway, Seattle & Montana Railway, Fairhaven & Southern Railroad, and New Westminster Southern Railway. Condition: near fine. Railroad Pass No. 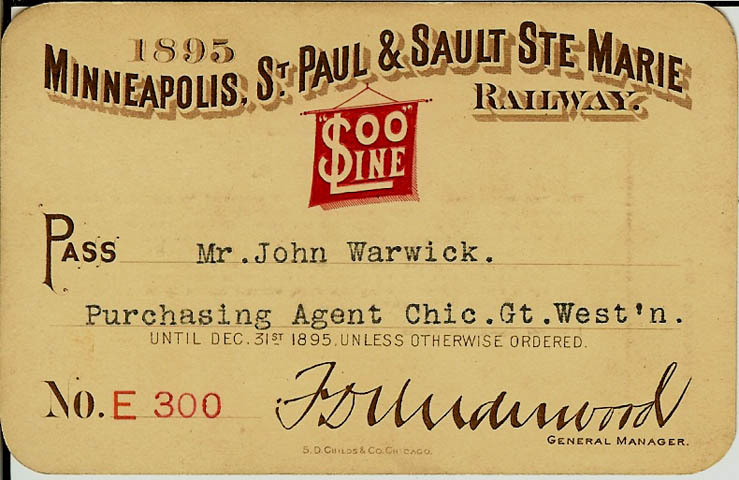 113, issued 1894, to Mr. John Warwick; countersigned on back by S,M, Rogers. Condition: near fine. 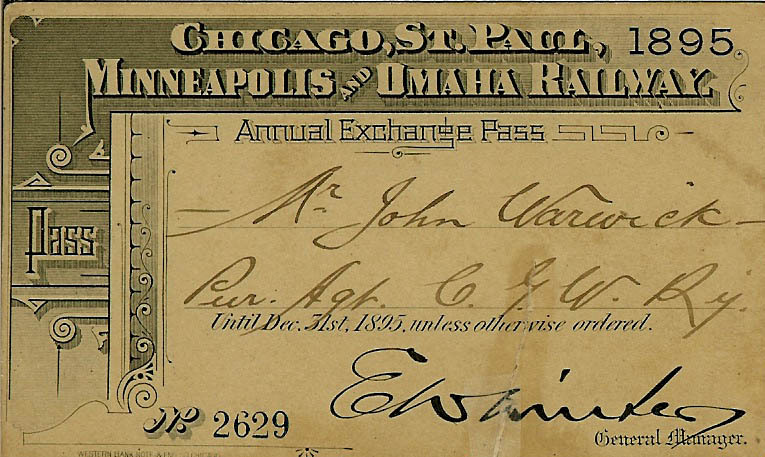 Railroad Pass No. 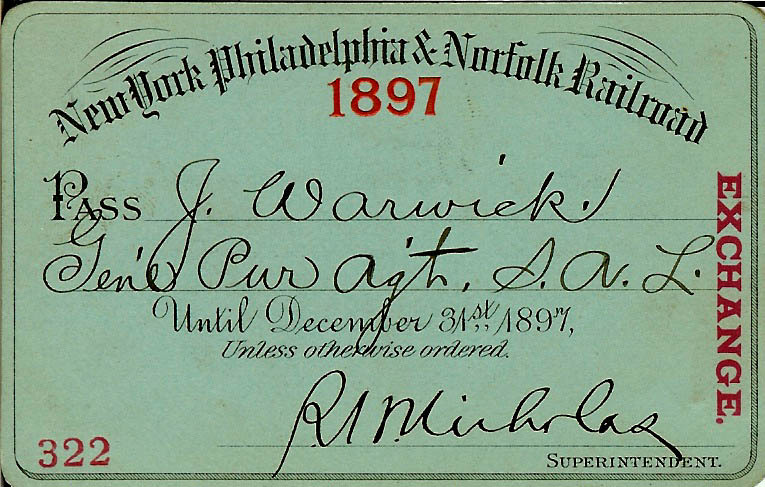 18781, issued 1900, to John Warwick; countersigned by J.G. Metcalfe, General Manager. Condition: very good plus; some light foxing. 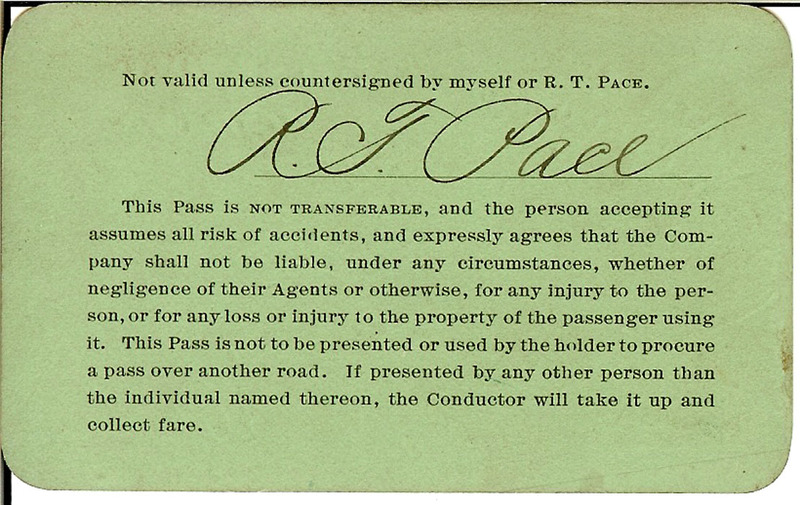 RAILROAD PASS NO. 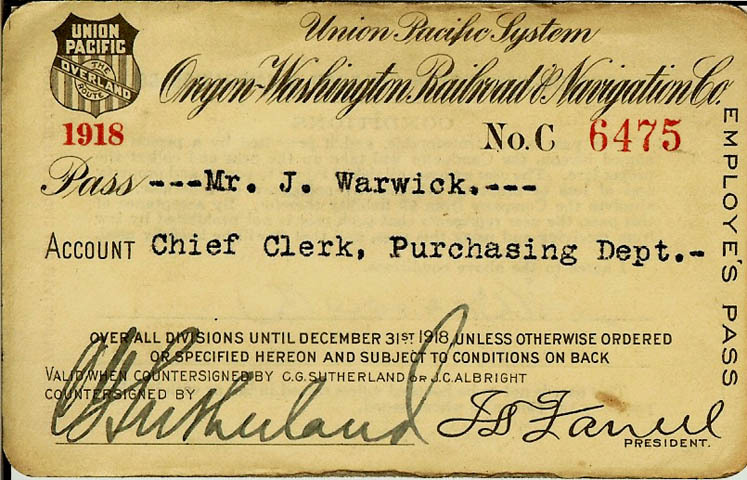 7, issued J. Warwick, signed on front by O.B. Grant, Superintendent, 1900. Printed by The Bailey Banks & Biddle Co., Philadelphia. 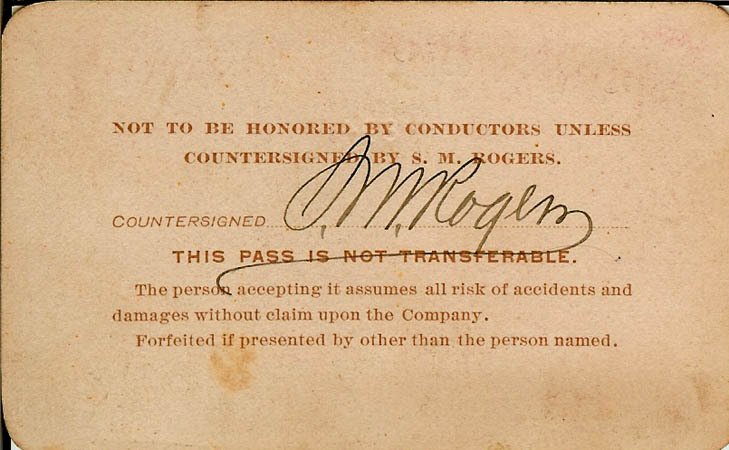 Railroad Pass No. E300. 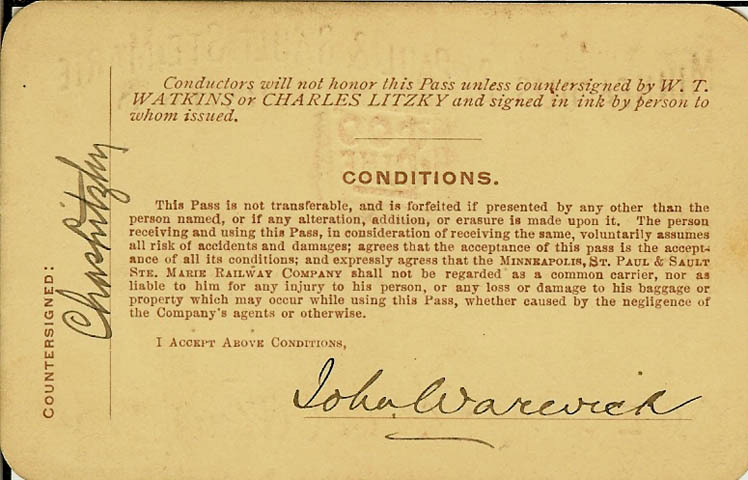 Issued 1895 to Mr. John Warwick; countersigned by Charles Litzky. Near fine condition. 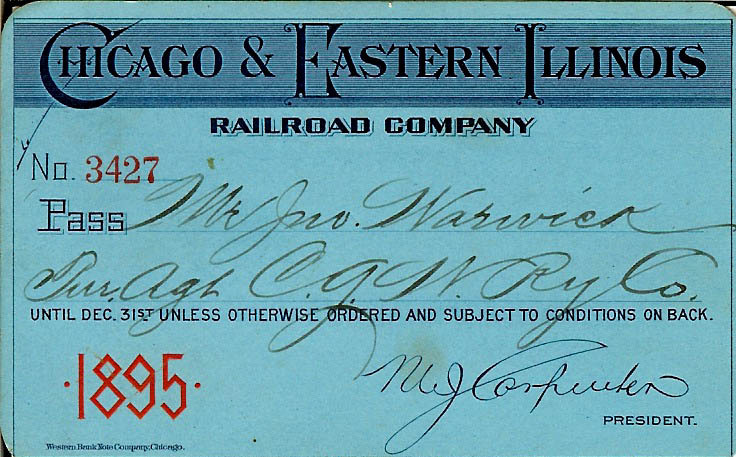 Railroad Pass No. 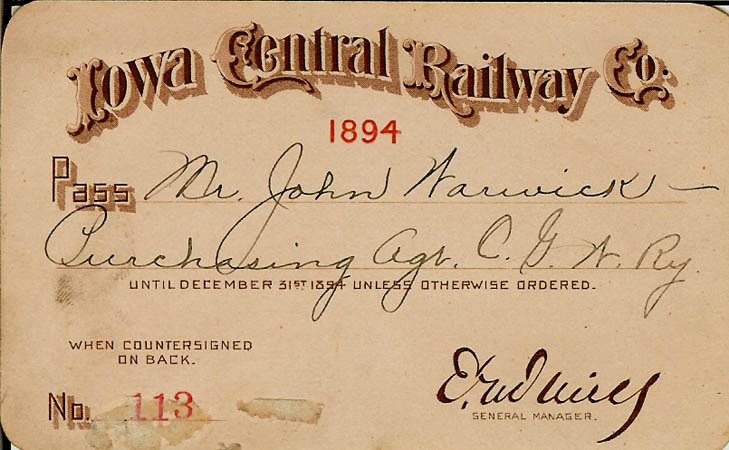 C 25, issued 1899, to John Warwick, signed by Warwick on back. Minnesota to Missouri railroad. Condition: very good plus to near fine. 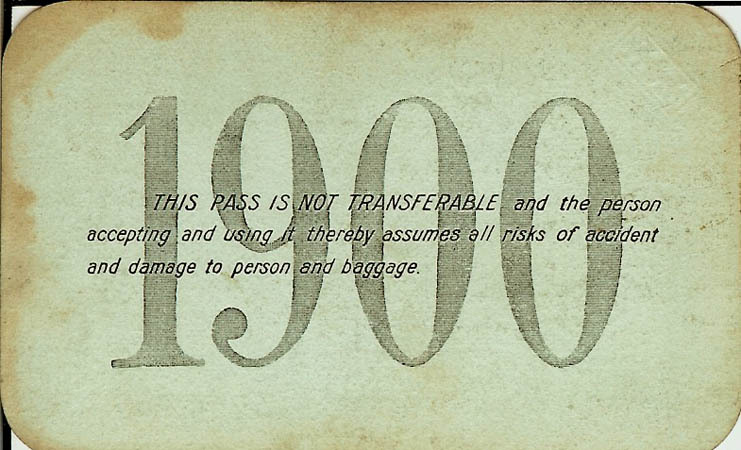 Pass for New York, Pennsylvania, Maryland, Delaware, and Virginia. 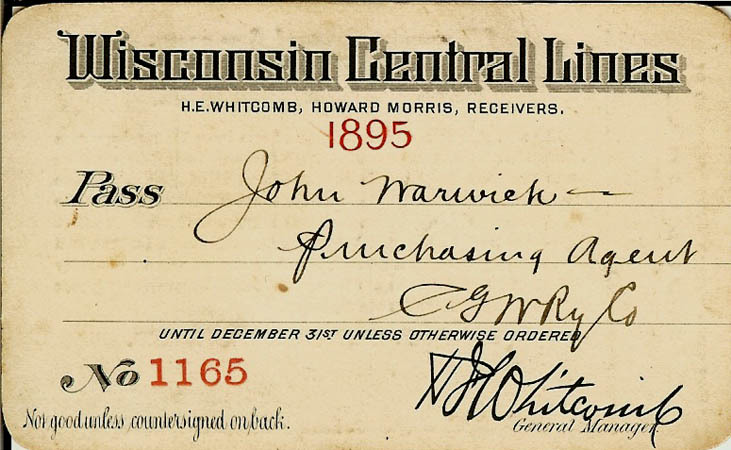 Issued to John Warwick, 1897. Signed by R. Micholas, Superintendent. Pass No. 322. Near fine condition. 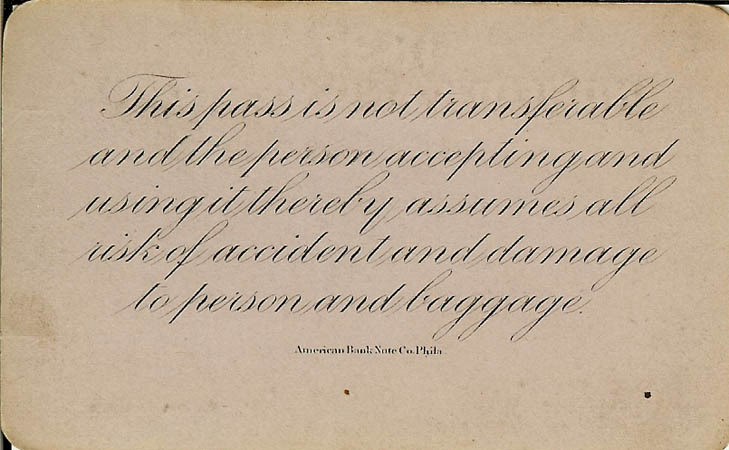 Railroad Pass No. 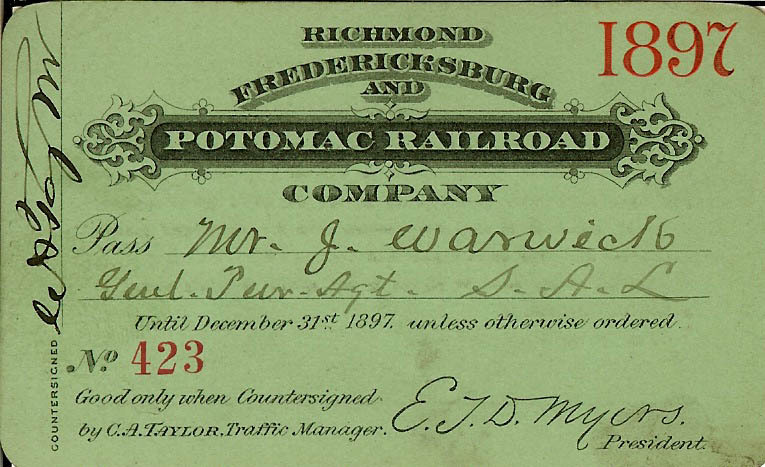 27, issued to J. Warwick, and countersigned by the General Manager. Condition: near fine. American Bank Note Company printing. 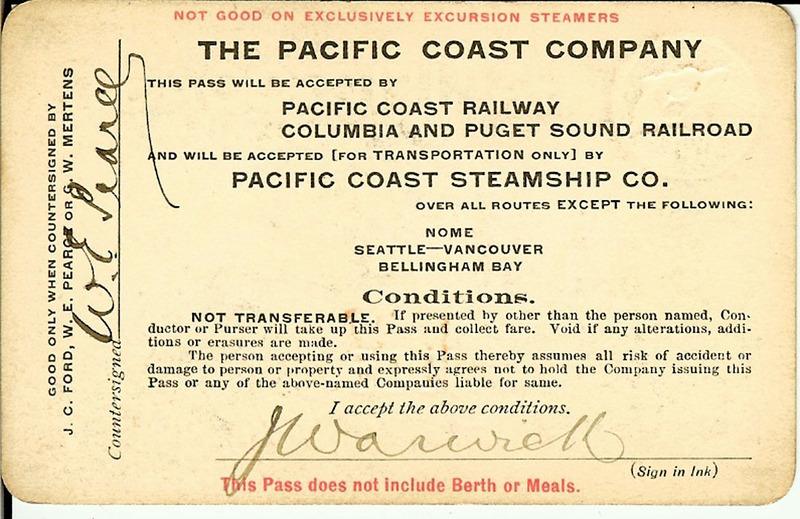 Pass was accepted by: Pacific Coast Railway; Columbia and Puget Sound Railroad; and, Pacific Coast Steamship Company. Signed by G.W. 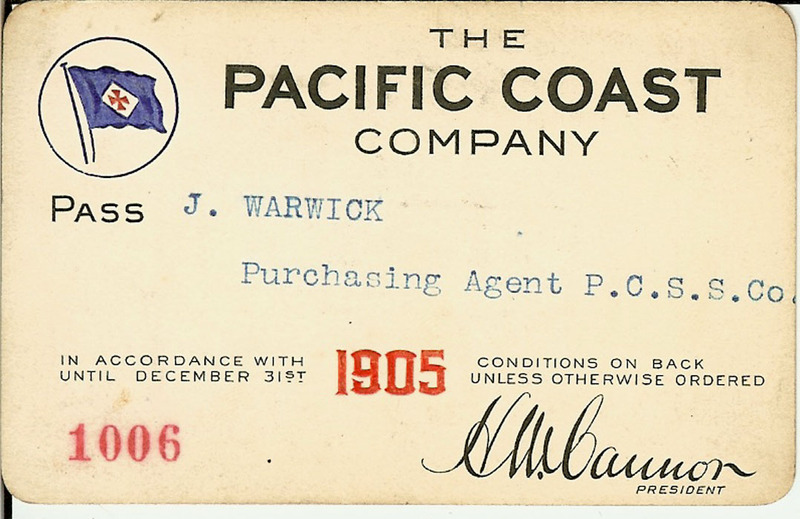 Mertens, General Manager and John Warwick, Purchasing Agent for the Pacific Coast Steamship Company. 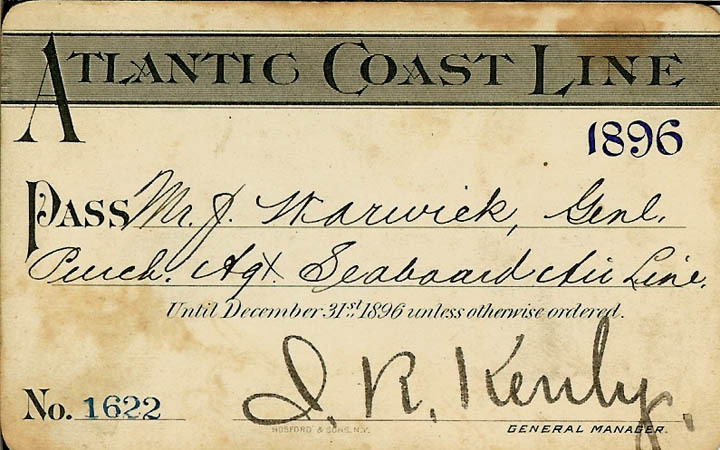 Pacific Coast Company owned mining, steamship, and rail operations in Washington, Oregon, and Alaska. 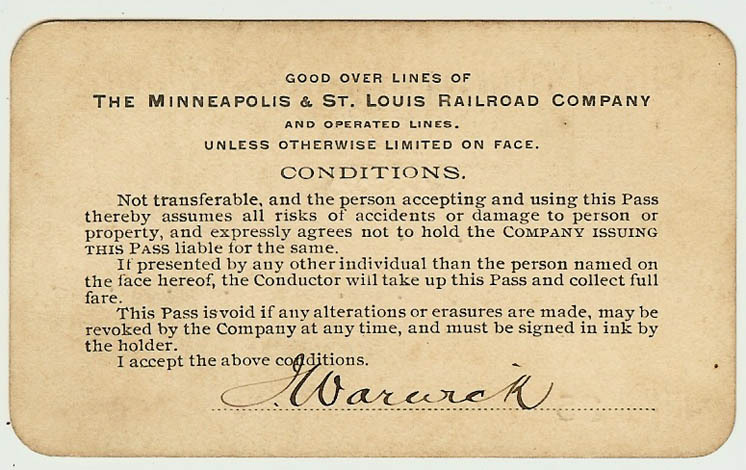 Railroad Pass No. 1006. Near fine condition. Railroad Pass No. 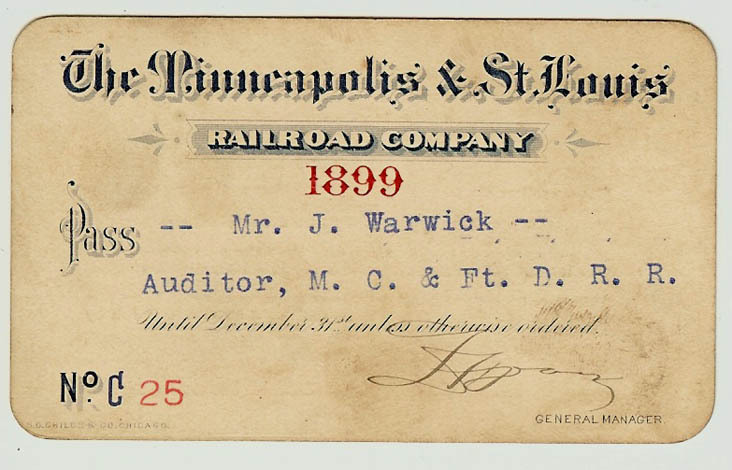 423, issued to Mr. J. Warwick, 1897. Countersigned by C.A. Taylor, Traffic Manager. Railroad Pass No. 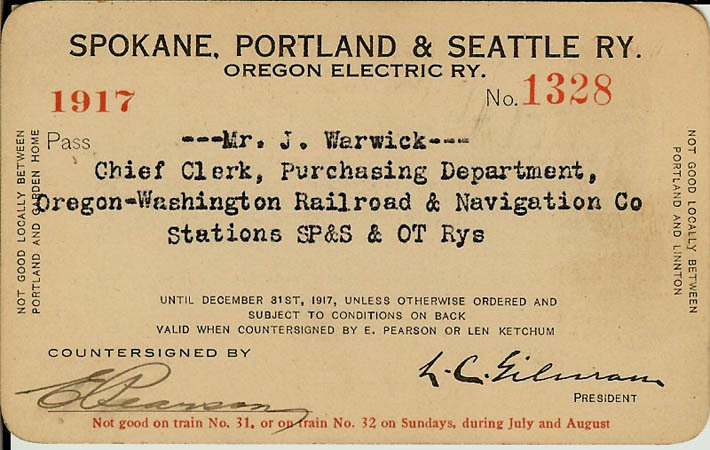 1328, issued to J. Warwick, 1917; countersigned by E. Pearson. 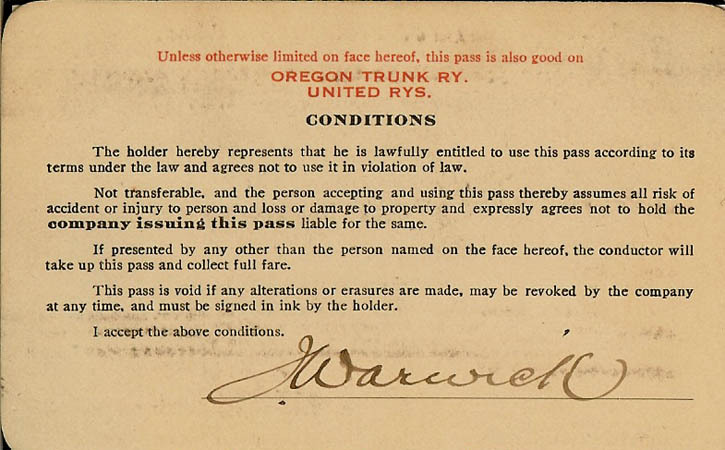 Also good on Oregon Trunk Railway and United Railways. Condition: near fine. 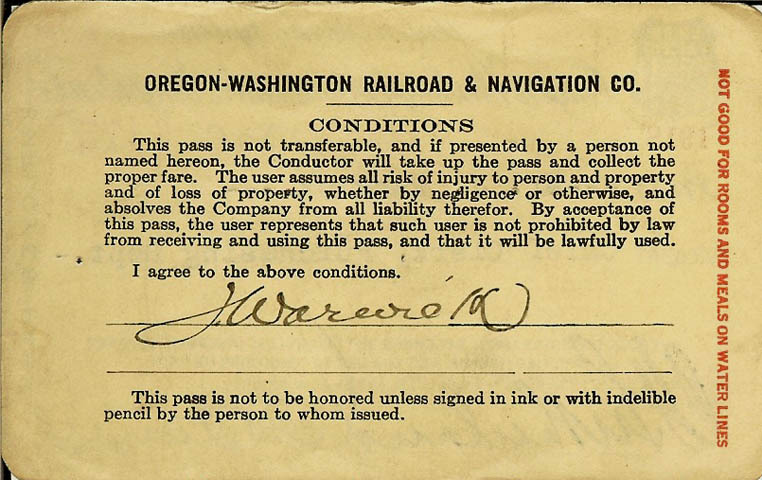 Railroad Pass No. 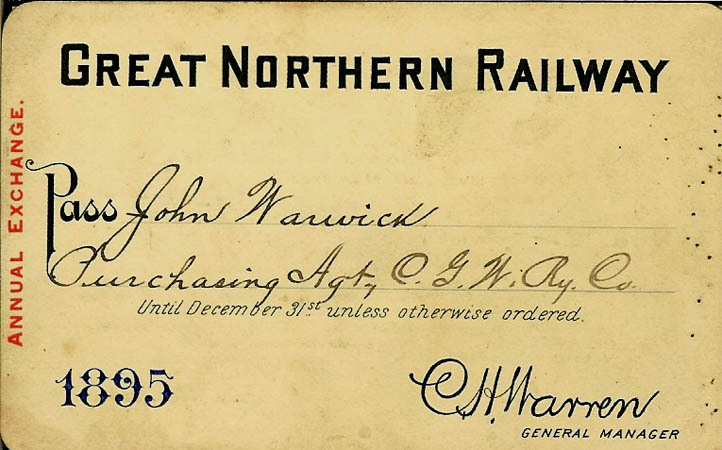 1165, issued 1895, to John Warwick; countersigned by W.G. Moore. H.E. 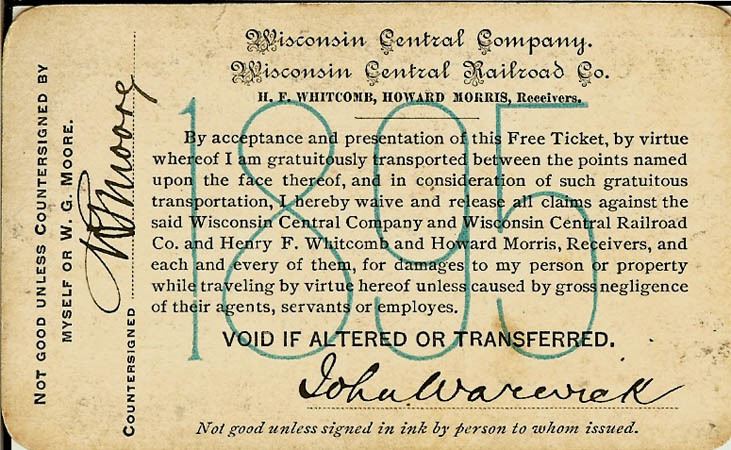 Whitcomb, Howard Morris, receivers of Wisconsin Central Company and Wisconsin Central Railroad Company. Condition: near fine.